Its going to be a short strawberry season this year - simply too much rain! Unfortunately cherry season will be even shorter - again, too much rain. Kendra, a Malvern Farmers Market regular, and excellent cook, sent this recipe along for Strawberry Conserve. What's a conserve - its just another name for a jam or fruit preserve. Inspired by Kendra, I decided to make some strawberry vanilla jam from one of my favorite foodie bloggers, Marisa McClellen from Food in Jars - you'll find the exact recipe at her link. What I love about Marisa's recipes is that are "small batch" - quick and easy, and just enough to keep your pantry in stock until the next season. The first step in making the jam is to macerate the berries with sugar and vanilla beans - to do this I just place my hulled and washed fresh berries into a bowl, sprinkle with the sugar and the vanilla, and then bruised them using a potato masher. I don't want to mash them, just smash them enough so they start to give up some of their juice. Don't forget to add the vanilla beans - they add so much flavor. I put my berries in the fridge for a few days to allow them to get nice and juicy. The next step is to cook the berries to gel stage - the easiest way to tell if you're at gel stage is to use a thermometer - you want to cook the berries to 220 degrees. Once the jam has reached gel stage its time to "put them up" or "can them". This is simple - all you are doing is cooking them in a water bath in special canning jars. This step ensures you are killing off all of the harmful bacteria, allowing your "canned" products to be shelf stable at room temperature. Once your jars are removed from their hot water bath and allowed to cool, a vacuum seal will form. You cam learn everything about canning from the Ball Home Canning website. For small batch processing I use this nifty little basket from Ball Home Canning - it works really well and fits into your standard Dutch oven or pasta pot! You'll also need a wide mouth funnel to fill your jars, and this handy jar lifter - you'll see this in action later. The green canning basket, wide mouth funnel and the jar lifter. The wide mouth funnel is a must have as it allows you to fill your jars without dripping all over the rim of the jars - this is important for a good seal. After filling the jars with your jam, always wipe the rim of each jar with a clean cloth, and put the two part lid onto the jar. 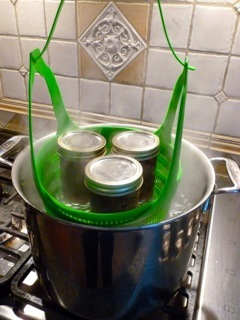 Load up the basket with the jars - it will hold 3 comfortably. Then carefully lower it into a pot full of boiling water, cover with a lid, and process for 10 minutes according to the recipe. Remove the jars from the boiling water using the jar lifter. You'll hear the jar lids ping as they cool - this the a sign the vacuum seal has formed. Aren't they beautiful - 2 quarts of berries gave me 4 1/2 cups of strawberry vanilla jam! Look at the big pieces of berries and the vanilla seeds. Yum! This winter, I'm going to pop open one of these jars, spread that jam on a piece of warm, buttered toast, take a big bite, close my eyes, and dream of spring! Works every time!